Embarrassingly, there are other agencies who’ve managed to write up our own campaign before we got around to it. Hey, we’ve been busy making it happen. Anyway, every March is Marie Curies annual Great Daffodil Appeal. A month of fundraising for the charity, which looks after those suffering terminal illness. Our strategy was to try and highlight the positive legacy of happy memories that Marie Curie helps those suffering to leave behind. 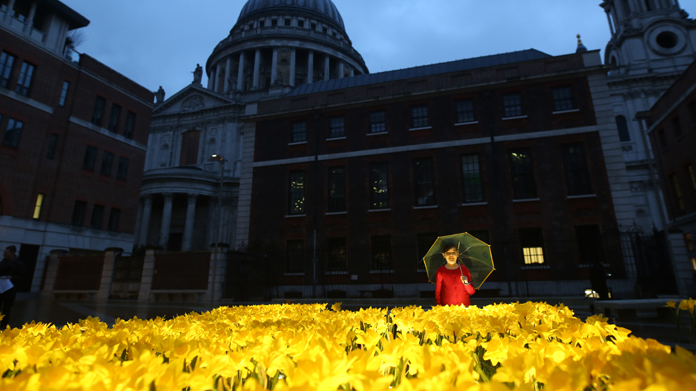 So to mark the month, we created a Garden of Light – made up of 2,100 hand-made daffodils. Glowing stunningly through the night, each flower represents a Marie Curie nurse, who bring light in the darkest hours. What’s more, we got to work with the brilliant and utterly passionate Andrew Shoben at Grey World to do so. Rather understandably, the Garden of Light has done a fiendishly great job across the media. Nationally, it’s featured across the Evening Standard, Daily Telegraph, Daily Mail, METRO, Daily Mirror, The Times (in London as well as Scotland and Ireland), CITY AM, the I Paper and Daily Star. It also did a remarkable job with broadcast as it scooped Lorraine, Good Morning Britain’s news slots, ITV national news, ITV London News (who broadcast live and did the weather from the installation and BBC Radio 5Live’s Wake up To Money. With no fewer than five pieces across Time Out (online, in print and in a video that has now been seen over 310,000 times and has had 10,000 engagements), the Garden has been stunning. All in, five pieces of broadcast, 14 national pieces across online and in print and another 74 pieces across consumer and international titles, the campaign has been a fitting start to Marie Curie’s appeal.